I am a big fan of cocktails and especially like drinking them on festive occasions such as Christmas and New Year's Eve. They usually look pretty and they add a little extra to a party, especially when they are homemade. This pear and rosemary cocktail is not too difficult to make if you have the right equipment. Gently muddle the rosemary sprigs in the base of a shaker. Add the remaining ingredients and shake with ice. 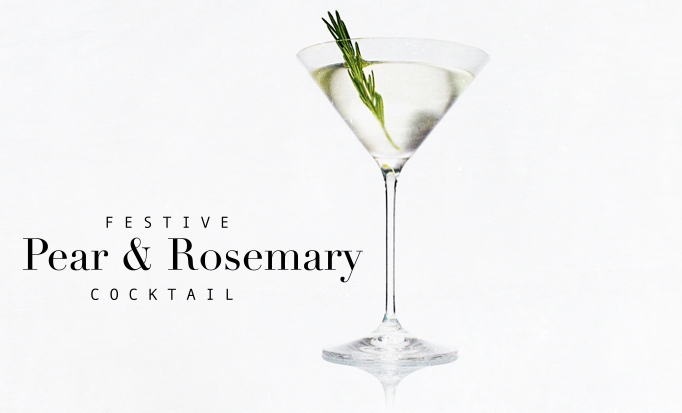 Strain into a chilled martini glass and garnish with a sprig of fresh rosemary. I personally love the interesting herby flavour the rosemary adds. And this cocktail is not too sweet, so it suits (almost) all tastes.